Minimal design makes your content stand out as it gives symmetry to your website layouts thus making it distraction free. Minimalistic designs have always been around but become the trend in the last few years. The flat and material design add to the minimalism with soft and clean colors. Great content needs a great website. 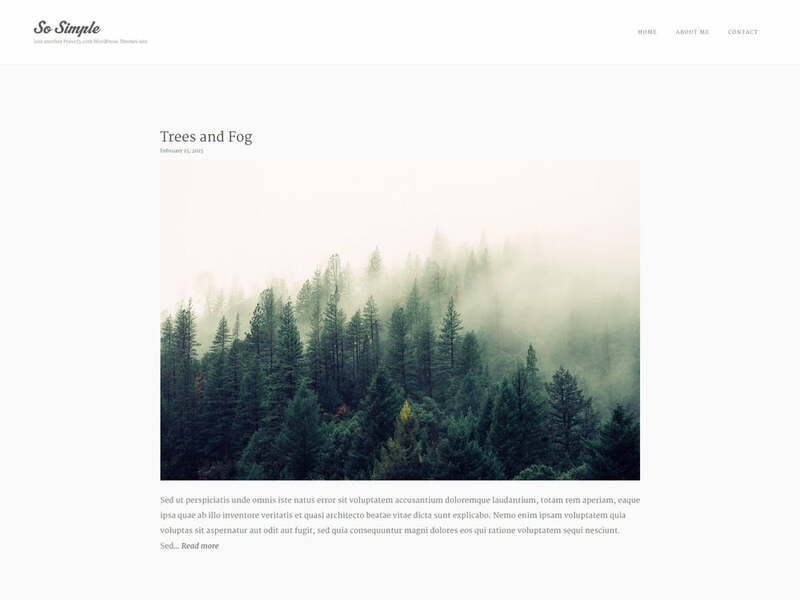 If you are looking forward to building personal blogs, portfolio websites then these minimal WordPress themes are your answer. This collection features the 20 most beautiful and free minimalist WordPress themes which will help you to design your new website. 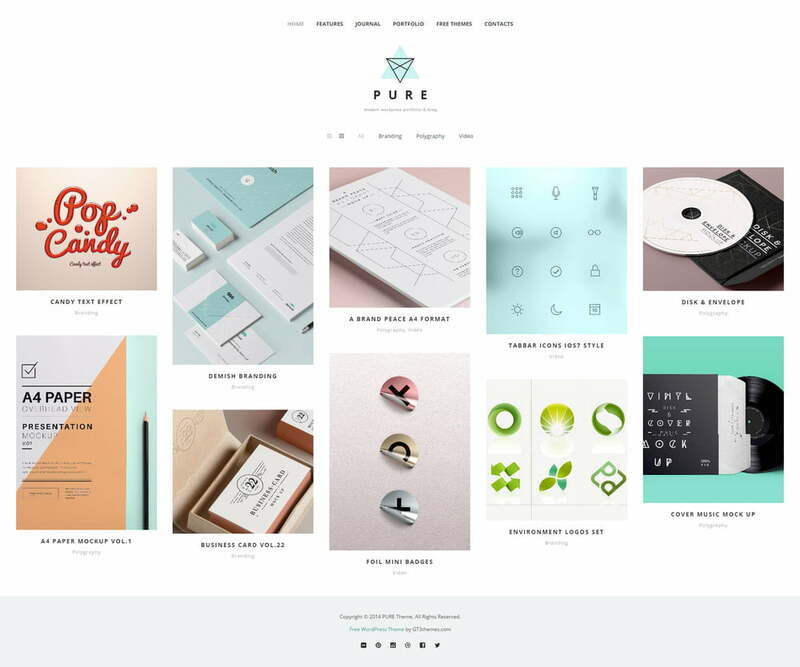 These free themes look wonderful with nice use of whitespace and smooth animations. You can select one from the list – click the demo link to see how the theme looks and later you can download the same. WordPress Gallery and Tiled Gallery(when Jetpack plugin is used). What do we think of Minimalist Design? All magnificent things are simple; simplicity is the heart of anything that is beautiful. Many are against the idea of a blog or website being overly decorated or has clunky information. 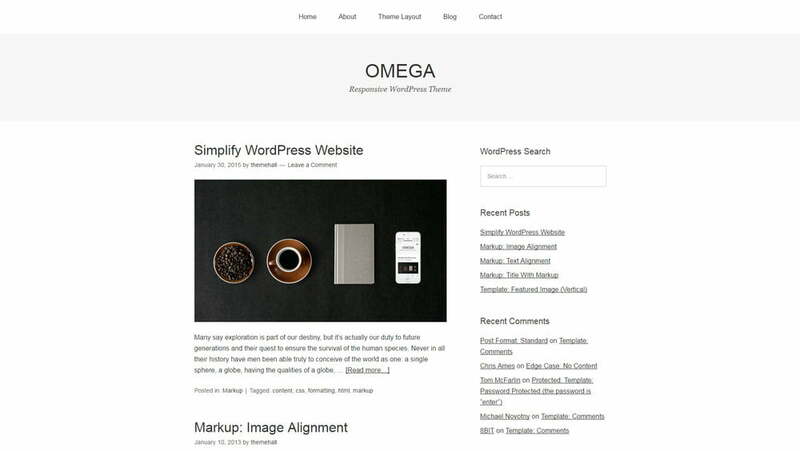 If you are an internet savvy who loves to blog or are using your website for official purposes but like to do it in a simple way you have to look for this kind of good minimalistic WordPress theme for your job. With a good hosting and good theme, you are all set. Good Luck. As the name says So Simple has eliminated all the elements which are not required for personal blogging theme experience. It lets you concentrate on content, it provides da istraction free reading experience to all your visitors. The theme has WPML plugin support that lets you translate the theme into any language that you wish. It looks wonderful on all desktops, tablets, and mobile devices as the images, videos and texts can be scaled from smartphones to computers. The theme is compatible with all popular browsers like Chrome, Safari, Firefox, and Internet Explorer9.0 and up. The theme options enable you to configure precise content like featured content, logo and the theme is absolutely free to download. 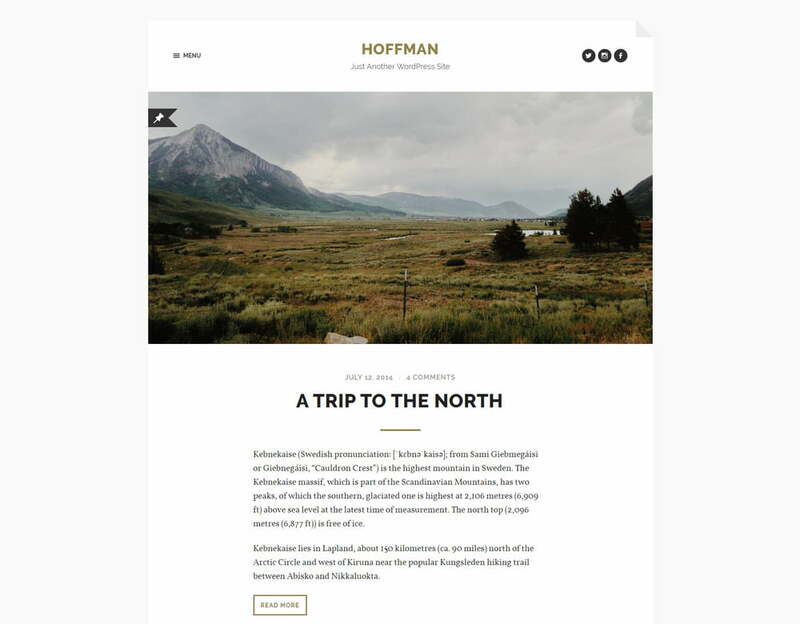 Hoffman is a retina ready and a responsive beautiful minimalistic WordPress theme. It has a set of social icons for you to integrate in your website for better connectivity. Blogs and websites look incomplete without pictures and Hoffman features a beautiful gallery which can either be used as a slideshow or run-of-the-mill posts both look equally attractive. You can use the three custom widgets for flickr widget, comments with avatars and posts with thumbnails. There is a built-in support for Jetpacks tiled gallery and infinite scroll function, all you need to do is install and activate. Built on bootstrap framework the WordPress theme is minimal and contemporary design. Bootstrap framework has helped in making the theme responsive. You can create a parallax effect with the desired image and a heading of full width by combining with transitional animations. Other basic features like chat, image, gallery, status, quote and status post formats are supported. There is beautiful multi-level navigation which is in three steps can be implemented for your website. You can add a logo and title or tagline and select whether or not to display both. You have six colour schemes and all have a charm of their own whether green, orange, yellow, red, blue or violet besides certain elements can be changed with 15 more choices of colours. 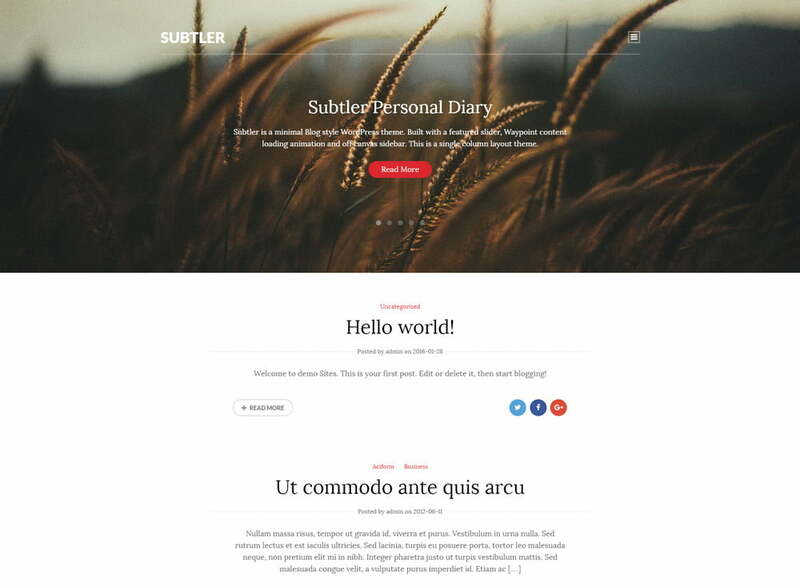 Subtler is a single column layout, minimal blog style WordPress theme. The theme looks equally beautiful on a computer or a smartphone which means you have more visitors for your site as nowadays people prefer to use internet over their smartphones. The minimalistic theme has been built with a featured slider, off canvas sidebar and content loading animation. You can configure your style settings from the option panel. There is a gallery which can feature your pictures. There are colours and fonts for you to select according to your requirement. This is a free visual diary WordPress theme for you to document your daily experiences. Post formats look beautiful with Yuuta theme and they respond great to mobiles and computers; your website is expanded. The themes featured images make your posts visually distinct. You just need to select a bunch of images of your choice and click upload and your gallery is ready, the images can be labelled and their sequence can also be changed. The gallery is tiled and there are social buttons which let you post to Facebook and Twitter automatically and also displays like buttons next to posts. 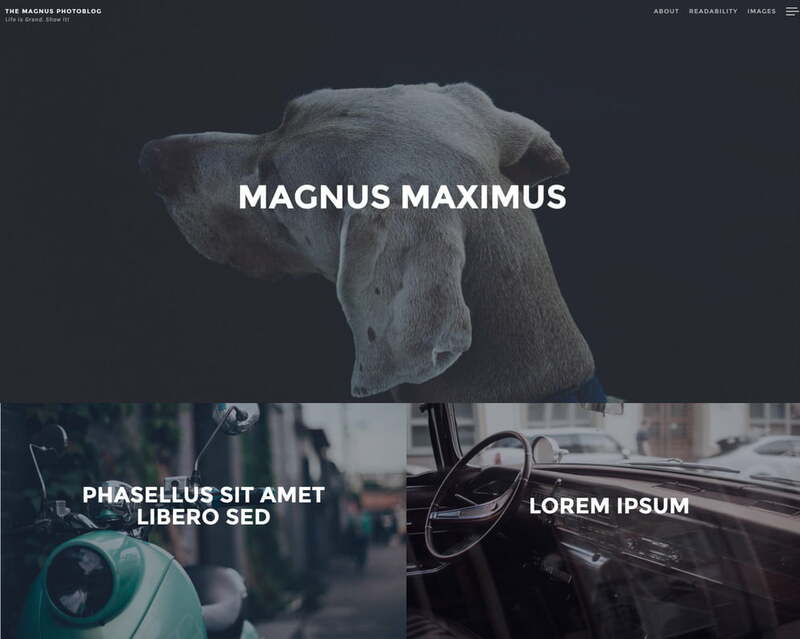 Magnus is one of the latest additions in the list of minimal WordPress themes. The theme is made especially for photo blogging and is Baeta’s first theme to get approval for a place in the official directory. The full-width images for posts give your images a spotlight. You can set your homepage to display posts and the feature enables you to see the latest posts featured image and title at the top of the page. Magnus has used two Google fonts to beautify the theme Montserrat for the header and Karla for the paragraph text. 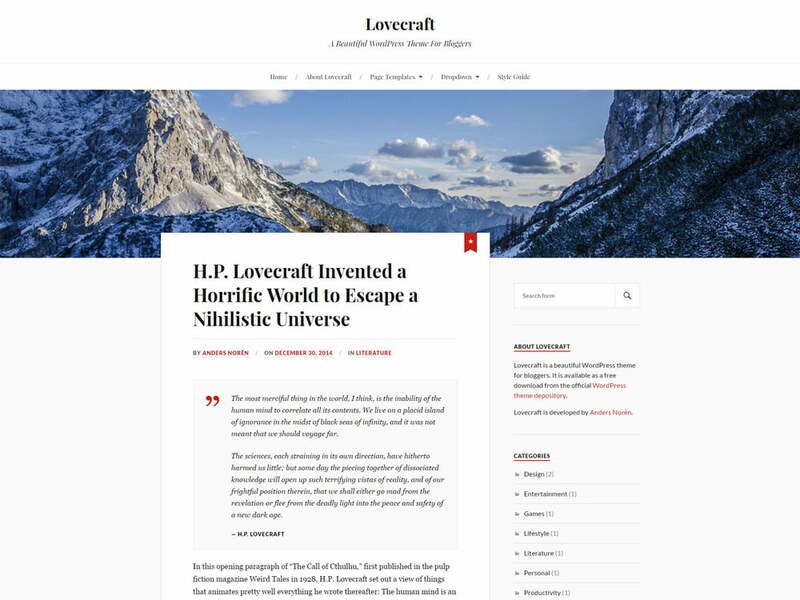 You can use the Lovecraft theme for your website or blog to attract more visitors as the theme helps your website and blog to get a good visual presence. It is a responsive theme and looks great on all devices from computers to smartphones. You can use full width pages without any side-bars making it stand out from the rest of the pages in the website. You can customize the header and add your own images, you have the option to upload many header images at a go and select those to be displayed one for every page load. 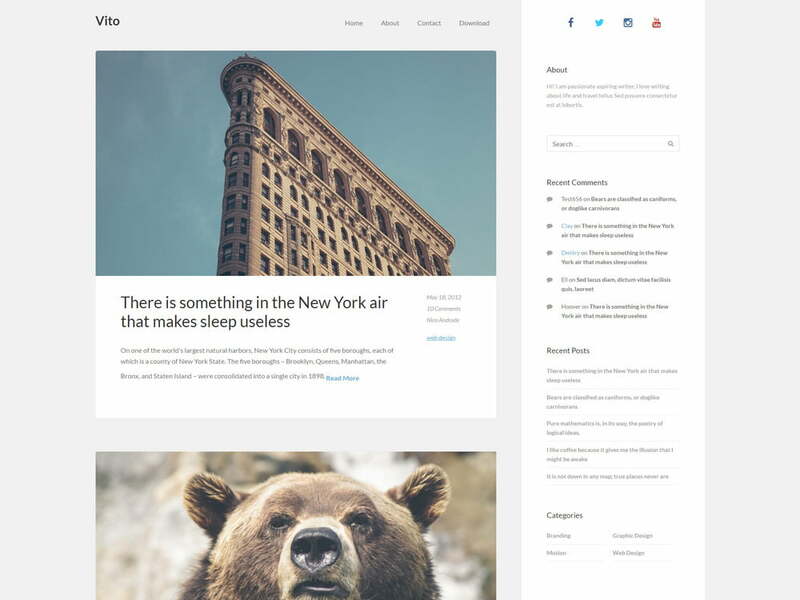 Vito is a modern and minimal theme especially for bloggers. It features simple white backgrounds, full –screen layout and a clean design. There are animated featured images and the posts are neatly arranged one below the other. The theme is responsive and feature sticky posts which are fun to use. Vito WordPress theme is translation ready which means you just need to encode the theme and translate it in the language which you wish to use. Besides being widgetized there are social media icons which can be featured on your blog. 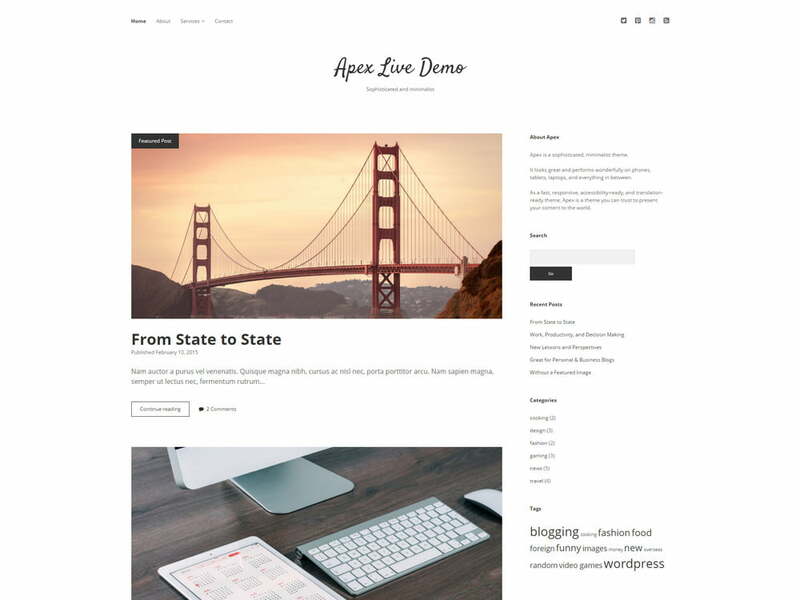 Apex has been built on Bootstrap 3 which besides making it responsive is also a dependable and robust WordPress theme for your blog or website. It is a one page layout design built in six different colour themes. The blog section of Apex includes a single blog post pages and features five blog post types text, multiple image post, single image post, quote and video post. If you have a team and wish to include their details you can do so with Apex theme. The theme is full of short codes and other custom icons which you can use in your website. 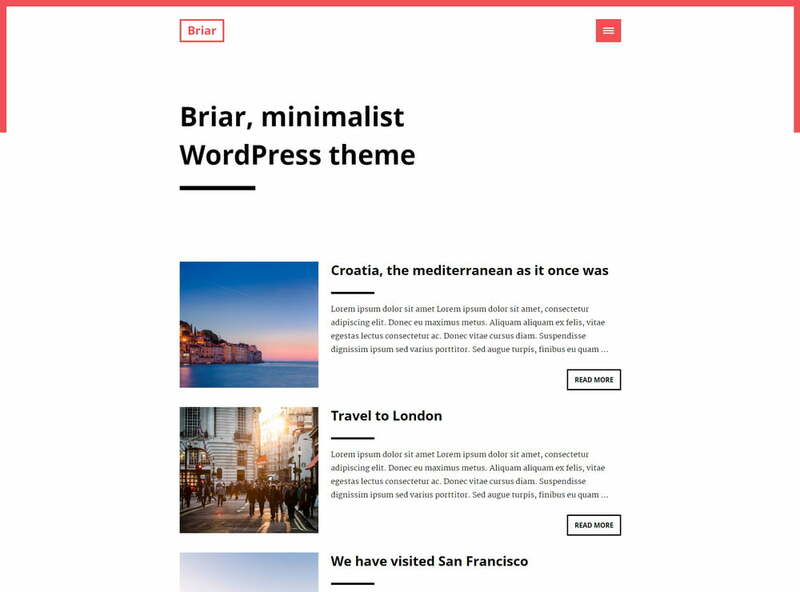 This minimal and clean design WordPress theme is perfect for travel, lifestyle, personal, story sharing, food and recipes blog. 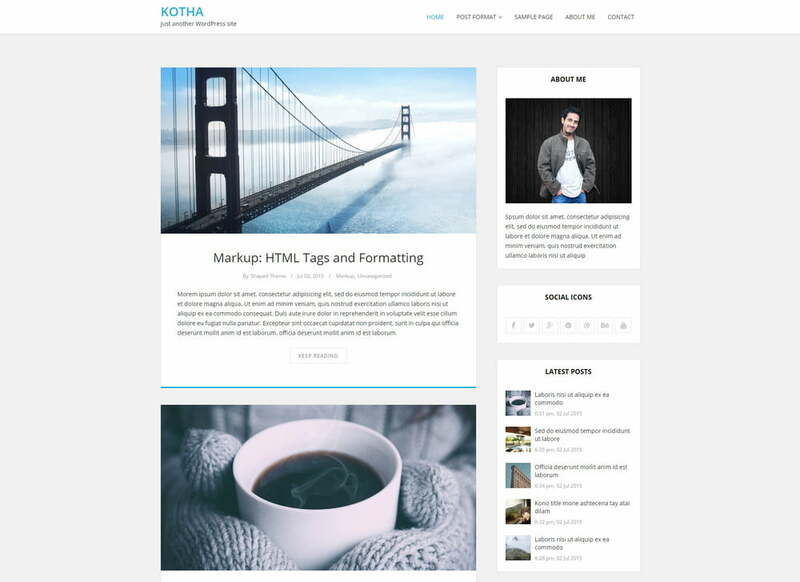 Kotha has a trendy design and helps in setting up your blog elegantly and in a clean way. It is WooCommerce compatible for you to sell products or have an online store in your blog. Other features include recent posts, sticky posts, 3 widgets, translation ready, popular posts and different colour theme options to create a beautiful blog. The Theme comes with a powerful admin panel for you to create stunning pages in your website. The WordPress theme is fully responsive and can be used for both personal and official purposes. Omega is compatible with all the popular browsers like Opera, Chrome, Firefox, Safari, IE9, IE10 and IE11. It is also WooCommerce compatible which means you can design your online store. There are social icons for you to add in your website and grow your social presence. It is an ultra-flexible and multi-purpose theme which is just right for your blog or website. 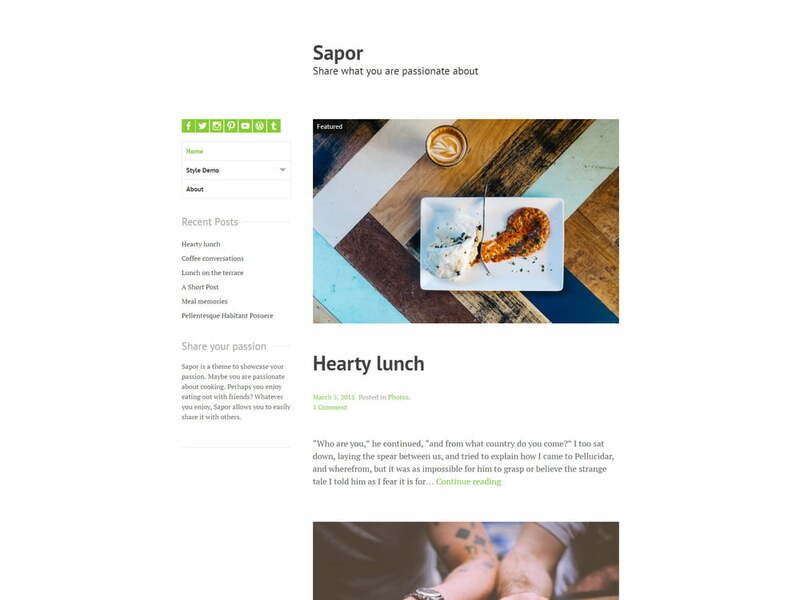 The developer made the Sapor theme exclusively for food blogs although other blogs too work perfectly fine with this theme. It mostly helps you display your love and passion for gardening, food, healthy living, cooking or others. You can craft yourself a logo and upload to represent your blog. Some features of the blog are its beautiful colour palette which offers you vibrant colour to choose from, optional sidebar, custom header, social menu and custom background. The WordPress theme is a minimal theme and is responsive which means you have visitors viewing your website or blog whenever they want. Libre WordPress is a minimal and responsive theme which looks beautiful on all screen types and devices. The theme will help you in constructing a standard and chic looking blog. 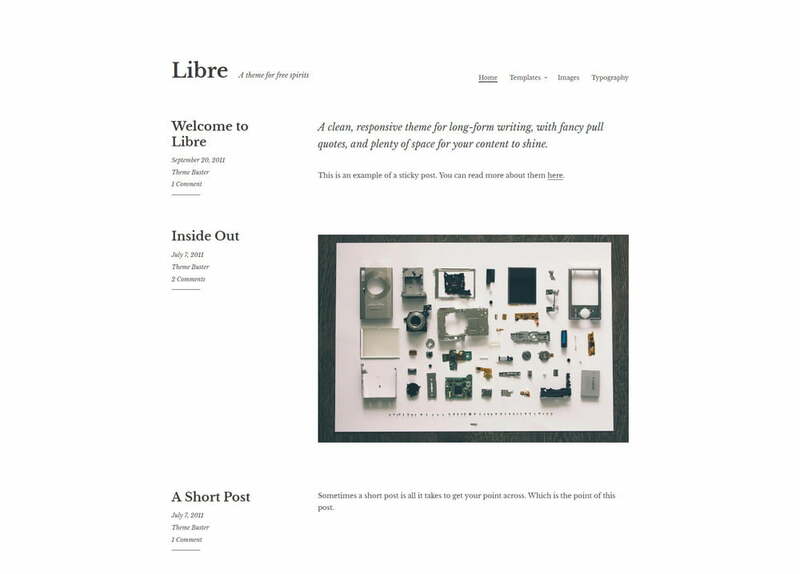 Libre was made exclusively for long form writing sites, so if you are interested in writing articles and creating content Libre minimalistic WordPress theme is the right theme for you. While your visitors are going through the content in your blog the main navigation bar stays on the top keeping the important content at hand. Three footer widget areas make place for your second content at the bottom of your blog. There are two custom templates which you can use or replace them with one of your own images which can be a full-width image template without a side-bar. 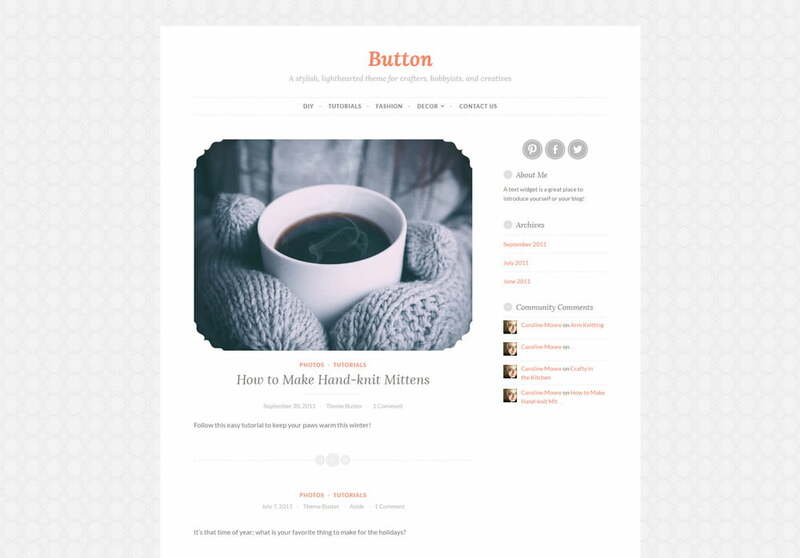 If you are artistic and have good skills in craft Button minimalistic WordPress theme is going to help you display your work in a beautiful way. The theme is fully responsive and works for all device screens big and small. It has a soft colour palette which is a treat to the eyes, detailed accents, gallery slideshows, and featured images. You can show off DIY’s, works of craft, sewing skills or have a list of favourites from all over the web. The cute theme is going to make your visitors fall in love with your blog. 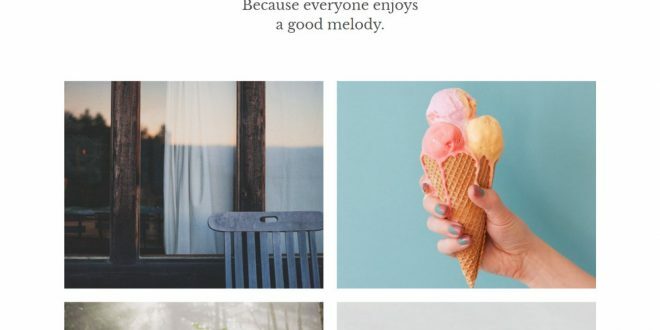 Simple Melody believes in giving visual rhythm and harmony to the readers of a blog. 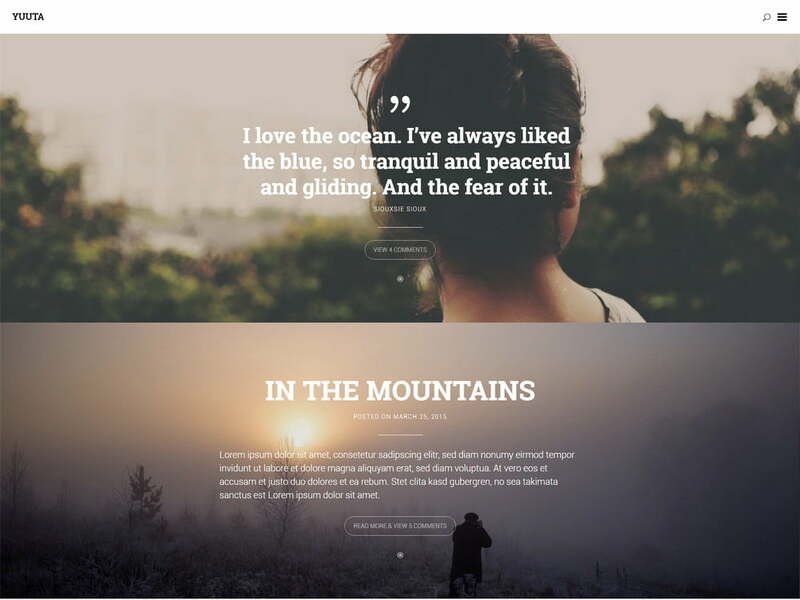 It is a light and minimal WordPress theme; the images are perfectly spaced and look great on all types of screens. You can have an introductory text for your visitors which can be customised and aligned right, left or in the center. There is a social media menu list with most of the icons of sites available. For featured posts you can select three of the favourite posts and highlight them while the rest of your website page stays aligned in the grid. The whole theme is perfectly customizable and can be easily changed according to your requirement. 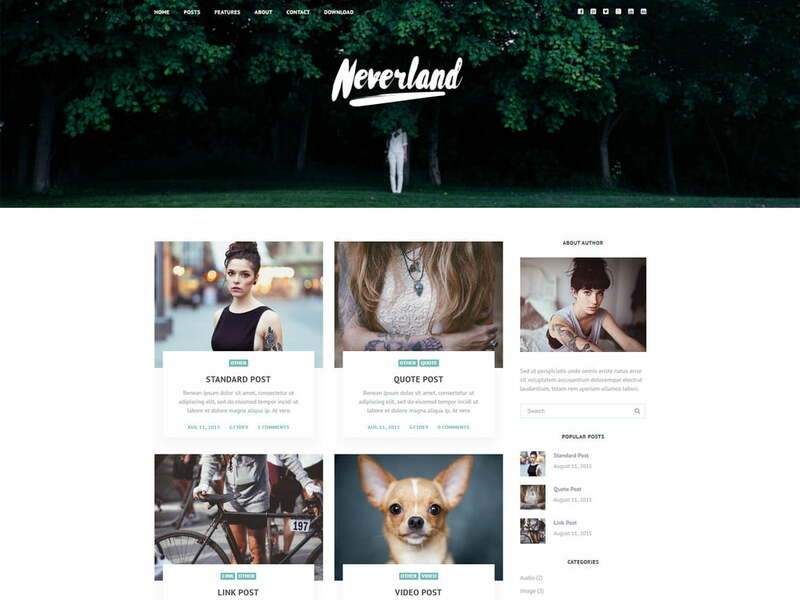 Neverland is a free to download minimalistic WordPress theme which has hundreds of wonderful features to create a beautiful blog. It is a clean and fully responsive blog with different blog layouts. The theme is also translation ready and can be encoded and used in the language you want. You select more than 600 fonts from Google and from a variety of colours to beautify your website or blog. There are six blog posts formats – video, quote, link, standard, audio and link. There are custom widgets, theme colours, custom logo upload, site tagline and title and many other features for you to use. 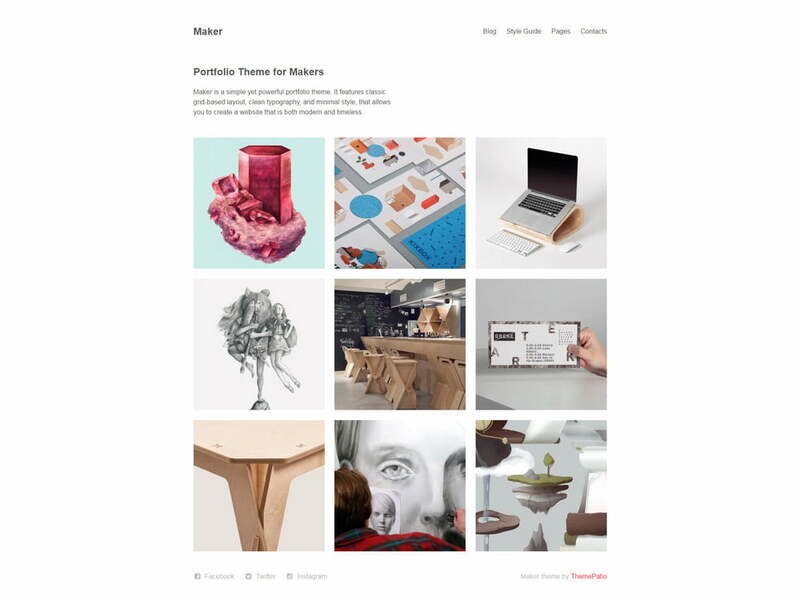 Maker looks beautiful on all high resolution screens and retina displays and has unlimited skins. This portfolio WordPress theme is super responsive, has seven post formats and many colours which you can select from. The theme customizer enables you to make changes in the elements of a website in a live environment and verify the changes how they look before you can publish them in the website. It features unlimited bars using which you can create custom sidebars and every page can be assigned to a sidebar. This portfolio theme comes with standard and beautiful templates which will help you set up your website in no time. It supports most browsers which are popularly used like Safari, Chrome, Opera, Firefox and IE9 and upwards. You have unlimited colour on your palette which you can pick from and the Google font selector with which you can decide the font you want. 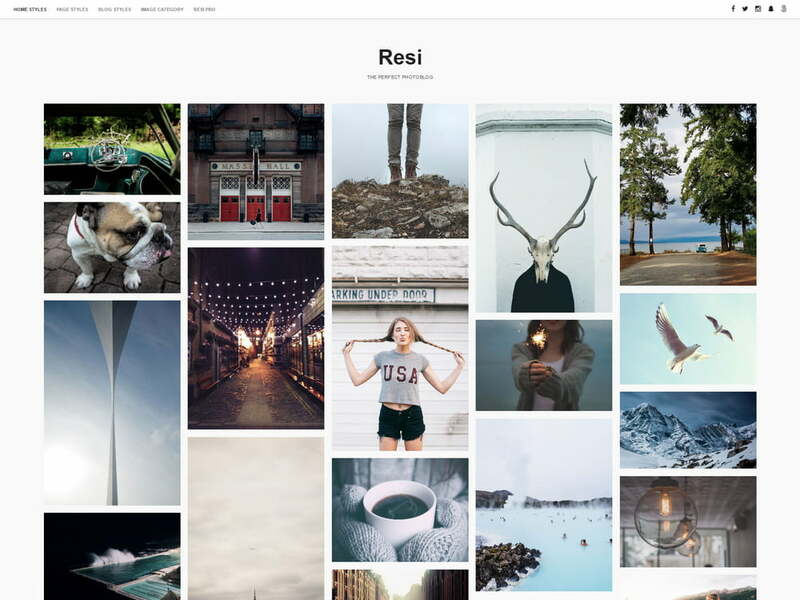 Resi is a responsive WordPress theme and will look wonderful on all screen sizes. Resi also promises free updates for life which means your blog or website will develop and progress always and its viewers will have something new every time. 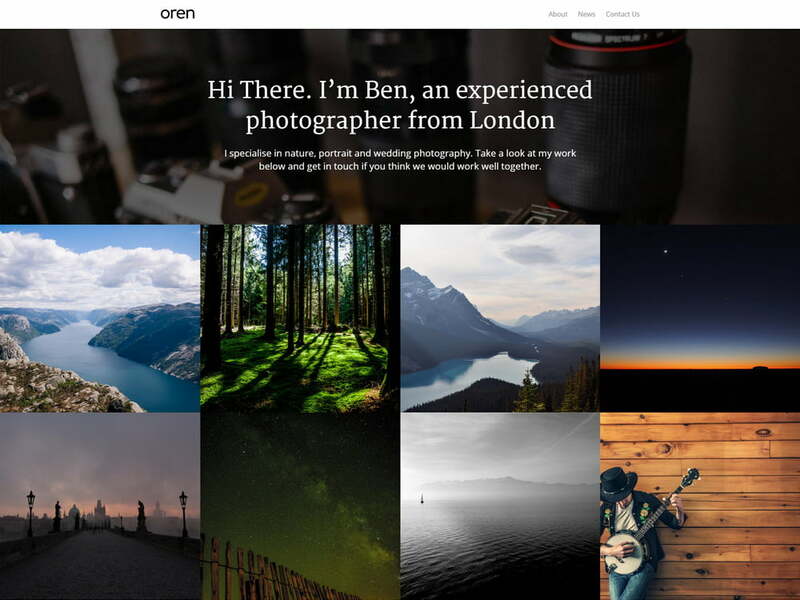 Oren is a minimalistic WordPress theme which is fully responsive with a modest free portfolio theme with a blog. The theme is wonderful to flaunt your work in style. The theme is extremely simple to work on and you don’t need to be an expert to design your website. You can add your custom logo and add a tag and title for your blog. The theme is perfect for photographers and people with originality. This minimal WordPress theme has been carefully designed for presenting elegant work. The theme is precisely meant for portfolio and blogs. There is a dropdown navigation menu in the homepage and an eye-catching header which you can replace with your own custom design or image. 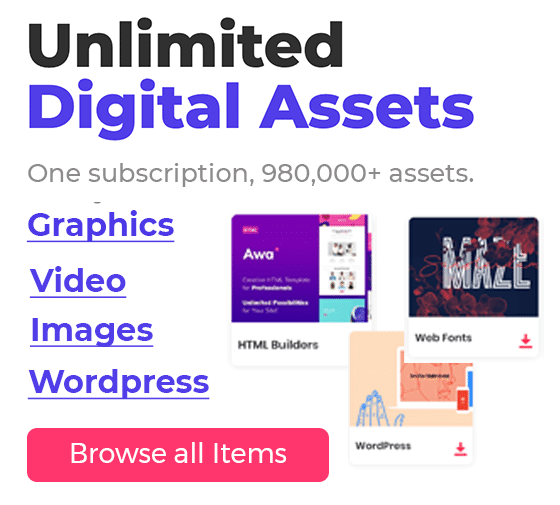 The theme is fully responsive and retina ready and has hundreds of features like gallery, blog posts, social icons, portfolio posts, promo texts, message boxes and many more.